Angleton, moving north at 30 mph. Very wet few days coming up beginning Sunday. The GFS is dumping 3 to 4 inches across the area between Sunday and Tuesday. ...SUMMARY... Thunderstorms will likely develop on Sunday across parts of the central Gulf Coast region including the lower Mississippi Valley. A few damaging wind gusts and a marginal tornado threat will be possible. 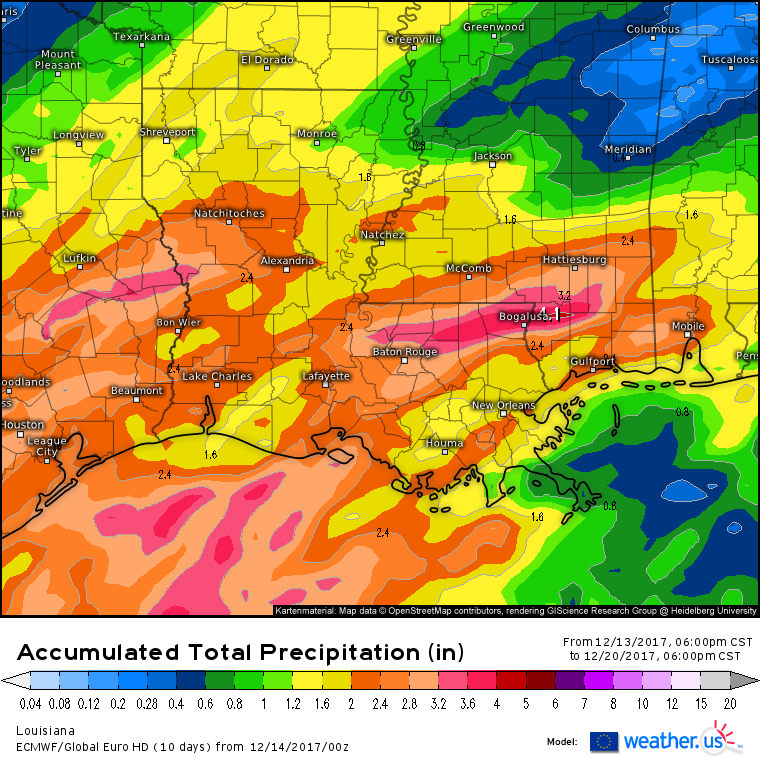 ...Lower Mississippi Valley... A shortwave trough will move quickly northeastward into the mid Mississippi Valley on Sunday as southwest mid-level flow remains in place across the Gulf Coast Region. At the surface, moisture advection will continue across the lower Mississippi Valley where surface dewpoints are forecast to reach the lower to mid 60s F across southeastern Louisiana and southern Mississippi by midday. Isolated to scattered thunderstorms are forecast to be ongoing in southwestern Louisiana at the beginning of the period with this convection spreading eastward into the lower Mississippi Valley by early afternoon. NAM and GFS forecast soundings at New Orleans, Louisiana and Mobile, Alabama at 21Z Sunday afternoon show weak instability with strong deep-layer shear. Although MLCAPE values are only forecast to be in the 250 to 500 J/kg range, 0-6 km shear values could be as high as 50 kt. This would be enough for a marginal severe threat making isolated damaging wind gusts possible with the stronger thunderstorms. 0-1 km shear of 25 to 30 kt will also make storm rotation possible and a marginal tornado threat can not be ruled out. As moisture advection continues and the shear environment is maintained during the evening and overnight period, a marginal severe threat could persist across the region. 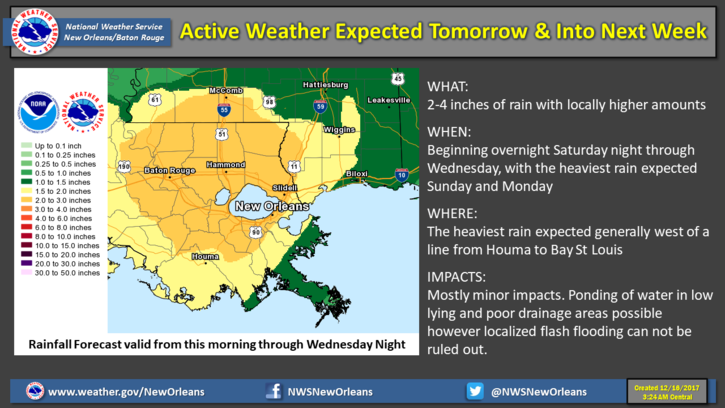 of rain will be limited to areas from New Orleans southward. advection will likely keep temps fairly steady throughout the day. air mass moving in will bring down nighttime lows quite a bit. touching the freezing mark Saturday morning. Coast through Tuesday as troughing is maintained west of the CWA. and went with a blend of solutions for pops. outer waters south and west of the delta today. south of Interstate 10. A few storms may be strong on Sunday. 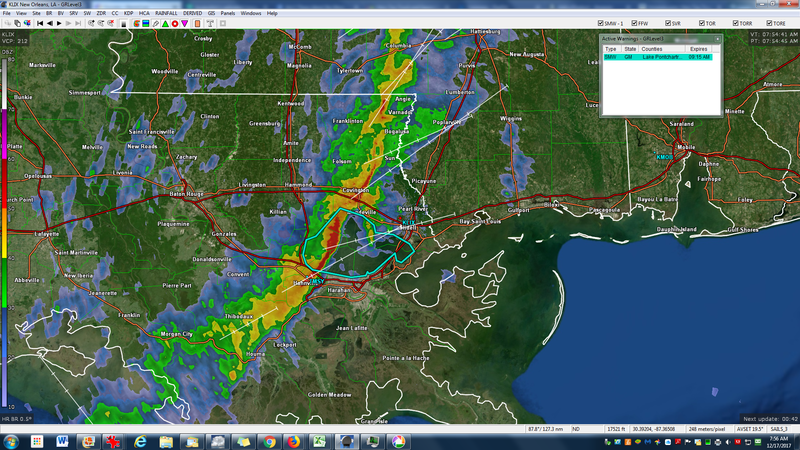 nm south of Lake Maurepas, moving northeast at 35 knots. HAZARD...Waterspouts and wind gusts 34 knots or greater. vessels and oil rigs...and create suddenly higher waves. life jackets. Return to safe harbor if possible. Maurepas, Orleans Marina, Eden Isle and Kenner. I'm in Galveston right now. When that line rolled through, it was friggin awesome with horizon rain, waves crashing on the seawall...very much like a tropical storm. There were even a few transformers that blew, but I believe it stayed below severe criteria. I'm just shy of 2 inches for today's rainfall. Dense fog is quickly expanding across the region. Heavy rain moving back in.